In 1985, Longwoods was hired by the Canadian government to see if we could help it understand why, over the past 15 years, its tourism sector had suffered a 50% decline. Canada's Image in 1985 and Ad Campaign in the 80's. Results of our US pleasure travel study showed Canadians that their old assumptions about their country’s attractions had been wrong. Our research shed light on what was important when selling Canada to Americans… that is was relatively close and easy to travel to, and that it was a warm, friendly and safe country to visit. Most importantly the research revealed that, in the minds of those US travellers who had actually been to Canada, what made it a great place to visit was its foreignness. 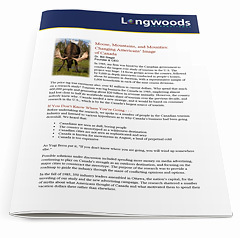 Longwoods' research became the foundation for rebranding the image of Canada in the minds of US travellers. The new campaign, "Canada, The World Next Door," would focus on the country's culture and diversity. We tracked the impact of “The World Next Door” campaign, and found that over the next four years, it had successfully transformed the image of the country from its stereotype as a country with lots of wilderness - but not much to do - into an exciting and unique foreign destination. Travel business grew 18% over that time period and, Canada's weak image was overturned, even surpassing that of the United States among Americans.